Add Display logic in online survey to filter the responses and proceed with relevant questions. 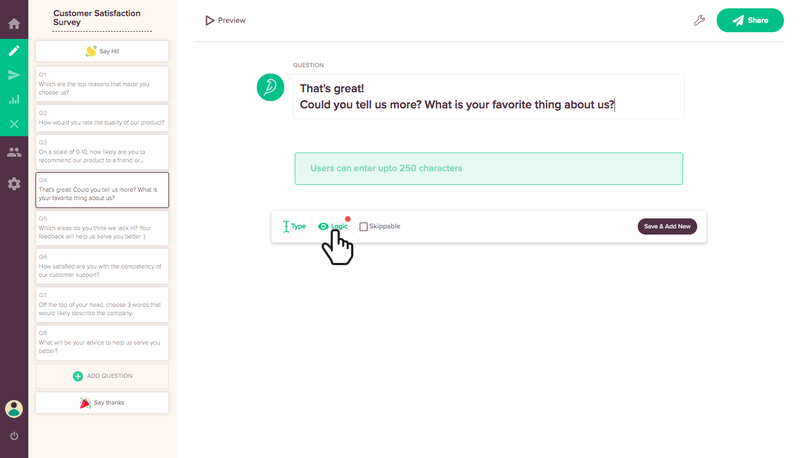 You can use Display Logic to ask relevant questions to respondents by tracking their responses to previous questions. Display logic is used to filter questions based on various criteria. 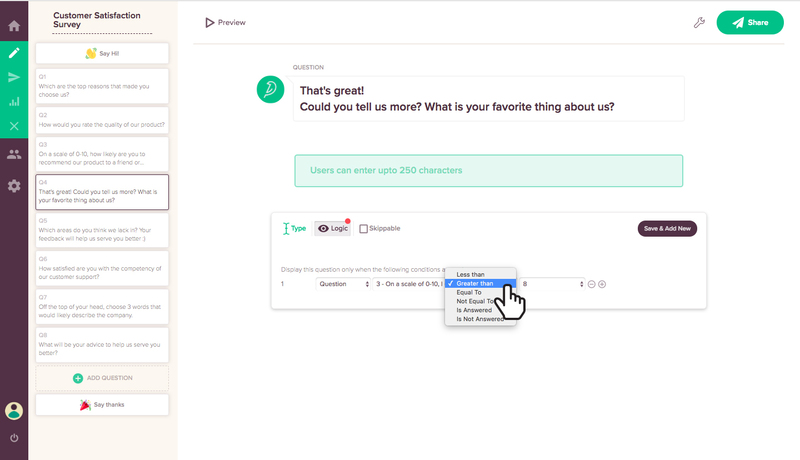 You can even set multiple conditions to skip questions with this feature. For instance, if one of your survey questions asks the respondents to rate your service on an NPS scale of 1 to 10. You wish to know the reasons why an unhappy user rated you below 5. Also, you want to request a testimonial of a satisfied customer who rated you very high. The neutral responses can proceed to the next question. In such cases, you can effectively use Display Logic in such cases. You can set the following question to track the response to the original question so they seem relevant to the audience. Select the question where you want to enable the display logic and click on the logic icon that appears below your question. By enabling this feature, your question will appear only when your set of conditions are met. 2 . Add the desired condition that you want to apply to the question. You can also add/remove multiple conditions using the minus and plus icons. 3. Preview your question to see that your question appears in the desired manner and proceed. Display Logic is enabled in this question so that the next question will appear depending on which answer the respondent chose. If the respondent choose a rating below 5, the next question is intended to identify the reasons why he is unhappy with the product. However, if the respondent picked a very high rating, you are more likely to receive a glowing testimonial. And for a neutral response, the system will skip to the next relevant question in the survey.